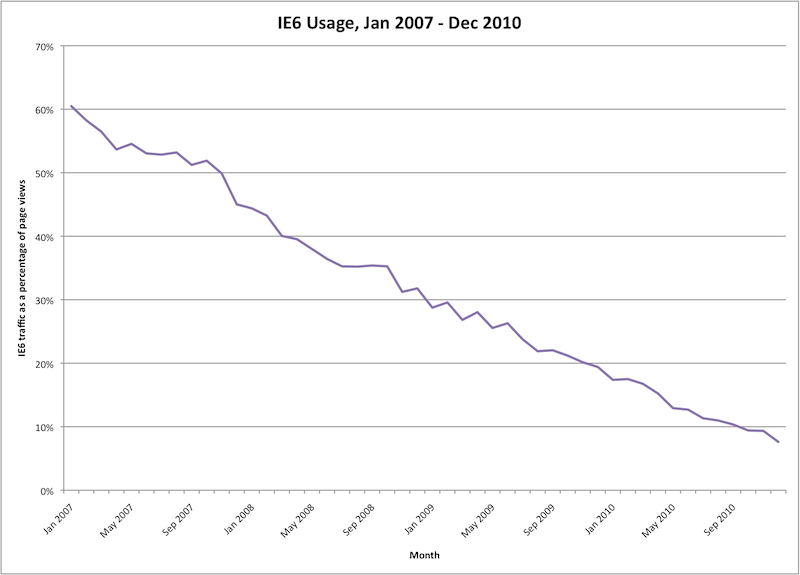 We’ve been tracking IE6 usage as a percentage of all page views on our site. We run a very popular regional news site with more than 50% market penetration in the southeast United States. Our users represent a real cross section of corporate, government, and home users. Some of those home users are still using dial-up connections. Here is a graph showing the trend over the past 4 years. It’s hard to believe that in 2007, IE6 still had 60% of the market. And even harder to believe that after 10 years, it still hangs on to about 8%! Looking more closely at 2010, we see a big drop over the year. If you take this at face value, it looks like IE6 usage went from 19% to about 7%, which would represent a 63% attrition rate. But I’m not convinced about the last few weeks of the year. Our normal weekday traffic skews toward big business, university, and government users. But at the end of the year, many people are taking time off of work, leading to a higher percentage of home users, and thus, a lower IE6 percentage. So the weekly and monthly averages mask the fact that about 11% of the weekday audience is still using IE6 in October and November of 2010, while only 4-5% of the weekend audience is using it. I imagine that many large IT organizations are slow to make the change away from IE6, either due to resource limitations or application dependencies. 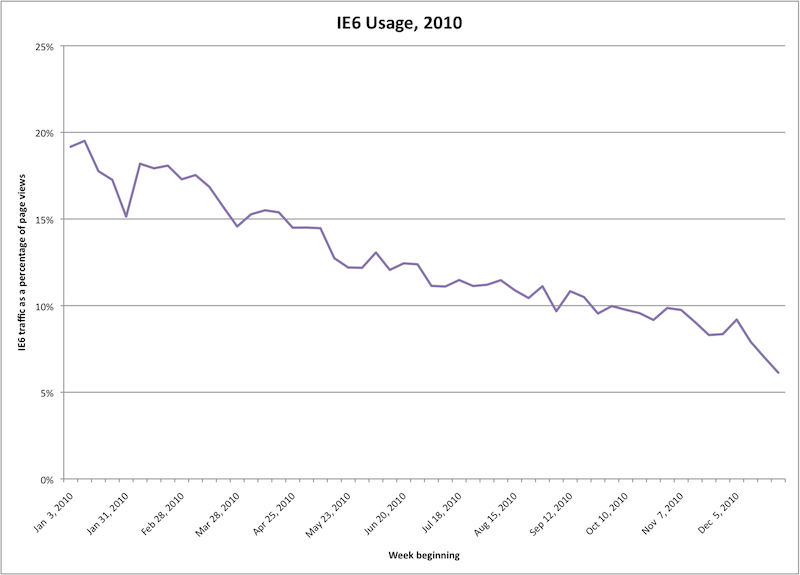 So usage of IE6 in large organizations is about 2 percentage points higher than the weekly and monthly averages reflect. So developers take heart! 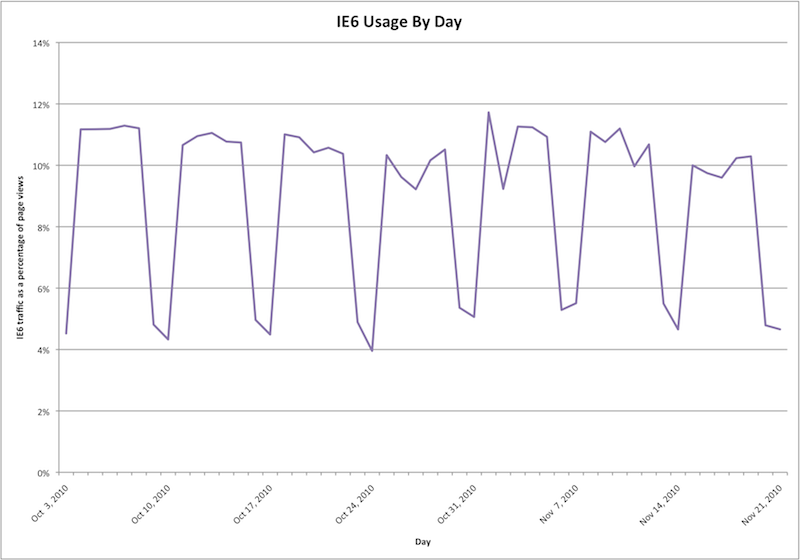 By extrapolating the 4-year data that we’ve observed, it looks like we may finally see IE6 usage reduced to levels that might allow us to ignore it in our application development. I think by August of 2011, IE6 might only represent 1-2% of average traffic, with perhaps as much as 4% in larger organizations. By the end of 2011, we might even see these large organizations get with the program and phase out IE6 so that it only represents 1-2% of their users. What will be interesting to see is whether there will be a snowball effect toward the end — as the IE6 web experience gets worse due to sites dropping support for it, abandonment might accelerate. On the other hand, however, there are likely to be some organizations that are so inextricably tied to IE6 due to legacy ActiveX applications, that they may not be able to migrate away from it. Pity the users in those organizations. One final caveat: keep in mind that the numbers you see here reflect our audience. They may not represent your site’s audience very well. I’m fairly certain that a site like Ars Technica or Planet CentOS would see very different numbers – lots of Firefox, Safari, Chrome, and Konquerer and almost certainly no IE6. But if you’re trying to reach a broad segment of US users, I think these numbers are probably fairly representative.